I had a forestry guy come out and survey the whole place and write up a wild life habitat plan. He was the one who said it needed logging bad as there is no cover for wildlife and the trees are choking each others full growth. The logger is a diff guy (the same guy the forester uses if he wins the bid) who wants the 60% cut because its less desirable wood. in the last few years around here 60 /40 their favor is what most people charge. There are no veener logs. Trees too close together to reach full potential yet all the timber was put into stands and only logs will be taken from 2 of the 4 stands of timber areas. Last edited by H5Farm; 02/11/19 06:47 PM. there can be (and usually IS!) a great deal of difference between selling trees and MANAGING your woodlot. hire a forester who works for YOU (not the logging company). your gonna be broke before ya get done payin everybody.about done with half mine. you can go broke a LOT quicker (and for a LOT longer!) if you screw up the management of your timber. There are times when their style of single-tree selection can’t be applied in your oak-hickory forest. However, most of the time it can. The idea originally comes from the Forest Service then they gave up on it and went with clear-cutting. Since the 50’s Pioneer has been applying the selective cut and they have healthier forests with an increasing percentage of white oak. That can’t be said of Forest Service land. Most landowners only get one shot to manage their property, why would you trust the first person who made you an offer? Just sounded like the OP wasn't too concerned with management, or money. He was going to go with the first guy and his offer. Hay pcr2 how many good wild plants you thing would be gone? he's a good guy,he told him so. yeah,logger prolly make a pile on the sang alone. Never sell timber without a forester and a signed contract. They will act as your agent and you have control over the harvest.Without,it will look like a bomb was dropped and no timber sale in your life time or your children's! The last forester I talked to charged 10% and did all the leg work, he measured and marked all trees to be cut and sent out up to a hundred bid packets to loggers around the Midwest. In my case I wanted a select cut with only the ash trees removed as they were going to die anyway ! You can have YOUR timber cut anyway you want and a good forester should be more than willing to work with you if you have thoughts of your own ! If your willing to let anyone have more than 50% of your logs then I have some swamp land for sale , lol ! I sold timber last winter and was paid half up front and the balance when the guy pulled out with the last load as agreed. All of the trees were marked and counted and I saw the logs that were pulled out and loaded. I was happy with what the guy did. I got three quotes. One to clear cut all of it and take anything large enough for a railroad tie, one to cut about half that and the third one only wanted some larger better trees and told me he thought I needed to only cut those and to call him in 10 or 15 years and he will do it again. That's the one I hired and he did great. pcr2 at least you could salvage the two caps. Never knew what a P.A. bar looked like. Take 160users advise and have it surveyed by a professional land surveyor, just a little oppsee over the line will cost you legal fees more that what it is worth. Log cutting for sawing and cutting for firewood is a whole different ball game. There will be 75 % left if only high grading for lumber. I got them to horse log our ash forest and 30 years later there is no stump damage done or visiable now. There was 25 more cords per acre from the foresters report stated. And I got 2 weeks of free fertilizer in the end from 2 Persian horses. Don't shoot but I'm a forester and a logger,were not all bad just take pcr2 for instance he's a good guy.red oak is the most valuable wood ,hickory not so much.the most important thing to consider before you hire any forester or logging contractor is references,and it's your job to check them out,go look at some of thier work,a semi load should be between 5 and 6 thousand board feet.familarize yourself with some of the terms ask some questions,don't leave it up to someone else.the best questions are the one that you know the answers to.if anyone takes offense to questions there UpTo no good. Good luck!! If you have any questions on me. say your mom and dad left you a used car lot that you know nothing about (they bought it after you moved out of state, you haven't been back, yada yada...). you don't know how many are month-old Porsche 911's, or how many are 1973 Pintos. probably some BMW's, but how many? would you sell without knowing what you have? if you do, the buyer isn't likely to waste his time with the Pintos, but that's what YOU'LL be left with, after the sale. Last edited by white marlin; 02/11/19 08:57 PM. Why would he owe SS tax on a lumber sale? Just asking. sounds like a hose job.Worth more than that as firewood. you need to set down and have a long talk with someone who knows how to use one of those for real, it is not swung like an axe and used as a striking instrument. If he did it right, which very few landowners do, he could pay zero in taxes on this timber sale. Now, he would have had to have the timber appraised by a forester and then set up a timber basis for his property which costs money but the potential savings in taxes can be significant. Timber, if cut after more than one year of owning the land, is taxed as a capital gain which is 15%. If you sell $20K worth of timber (not difficult to do) you’ll owe $3K in taxes, which is less than most appraisals. white oak prices are up now , if all he's cutting is white oak, get an idea on the price in board ft. I would clear cut it. I.am a timber faller and have worked in the woods my entire working career. Clear cut it and replant it. Makes great feed for deer and elk bears you name it. I would do 60/40. Just go In off.my experiences. That way you profit the most and have a fresh healthy forest starting over. What was the purpose of the forestry guy if everything is being left up to the logger? If he has a million $ equipment, why will it take him 4-5 weeks to cut 20-24 loads? How will he pay for his equipment the other 4 weeks? I had a client a few years ago that got taken at least 50-100K by a smooth talking logger. Deal on a handshake, good Christian logger. I'm glad you brought this up here, but this really is about the last place you should be relying on to make these kinds of decisions. not true, at all. (well, except that there are bad foresters, as well). the reasons to hire a forester include his/her expertise in managing your forest for present and future productivity. if you make a mistake in forestry, you and your kids and grandchildren will pay for it. and yes, your forester will protect the landowner's interests (financial, tax considerations and condition of the land following the harvest) with a good, solid contract. do your homework on your forester, too; and hire a GOOD one....you'll be glad you did. Last edited by white marlin; 02/12/19 06:12 AM. As an arborist, I would hire a forestry consultant to put it out for bid w/ multiple logging companies. I can tell you this... they are in the process of harvesting 250 acres near us and have left total devastation. There are many options for harvesting, certain trees w/ a minimum DBH, etc. Make sure you have a written contract in hand outlying what is to be cut & what isn't. Back to my 1st recommendation - you pay a forestry consultant to protect you & watch over the operations so that neither party gets screwed. That's their job & I can guarantee they're better at it than either you or me. Loggers cant make money cutting cull trees and leaving genetically superior seed trees, and most landowners are looking for the most money and don't give 2 licks about future production. If you talked to ten different foresters, you would likely get ten different harvest plans. Everyone has an opinion on how timber harvest should be done, but in the end it comes down to what the land owner wants. You should make sure both your forester and your logger know what you are manageing towards, and make sure they are capable of meeting you requirements. 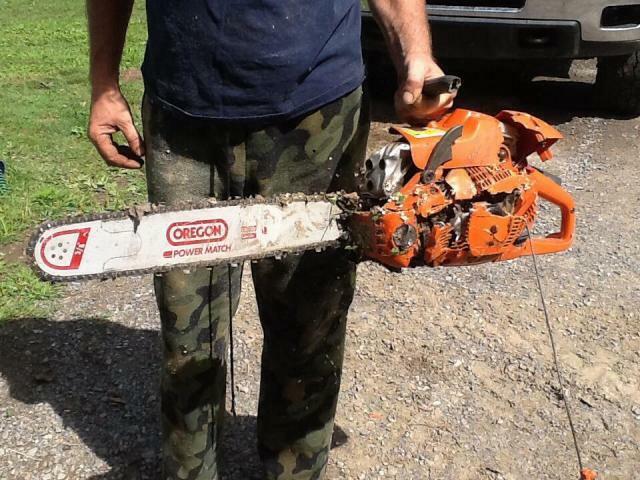 I am a 4th generation logger, and we seldom have to go through a foresters or sign contracts. We are know locally for being honest and working with land owner to achieve his or her goals. But if you are not comfortable dealing with loggers directly then a "good and knowledgeable" forester is certainly the way to go. My biggest piece of advise would be not to take advise from "foresters" online. No one can know what your woodlot needs without walking through it, with you preferably. And to the rest of you guys that apparently got took by your logger I must apologise, they're are many crooks in this industry, loggers and foresters alike. Perhaps more homework was required. Have you had your timber scaled to see how much is on your land? Have it scaled by a professional and put it out for bid. You don't have to hire anyone - call your local MDC office and ask for the forester. Tell him what you would like to do and what your goals are. Here in Missouri we have an excellent system with MDC and the forestry division. They will mark up your timber according to your plans and stocking rates and then advertise and you can get multiple bids if you so choose. Also - you can apply for a forestry management plan through USDA/NRCS and you will get funded for the plan. You then can select a TSP to write up the plan for you and get your rates at what you are stocked at and how many board feet you can remove. Don't listen to some of these folks that say I'd never cut a nut tree. An over stocked nut tree is still that - overstocked and your woodland will never be as productive as possible. Forests are to be managed and that includes timber harvest and sales. Walnut is at a premium now and white oak is high and also preferred over reds/blacks and hickories. There is a decent stave market close to you for white oak. Hire a Timber consultant. Around here they come in, mark the trees to be cut, figure out the board feet, managage the process and require a bond for property damage and put the logs out to bid............ before they are cut, so you know exactly whats coming to you. They do this for 10%. When we had ours logged, the bids were from $15,000 to $66,000 thousand. pretty big price swing........... and we had our money in escrow before a tree was ever touched. and he may see something you wont.i'm starting to cut 50 acres across from my house owned by the mill.they wanted me to cut all the ash but when they marked the lines,the forester has found something is killin the white oak there also so they want everyone of them cut also.i noticed some dead when hunting but forester says not a healthy one on the hill.big and plentiful so it'd been a large loss for them if not cut. I have had logging done on my place twice so far and the third time isn't that far off. I wanted my property managed for deer and grouse habitat so the cuttings have been small clear cuts to promote a diversity of age class timber. It has worked great and I have NO regrets at all. I got a few extra bucks but most of the timber stumpage was used for heavy equipment work and clearing food plots and trails. Any fruit tree or tree that produced a mast crop like oak was left. Those seed trees have really helped promote growth of new oaks and apples for the critters. Some small areas of low dollar timber were simply slashed and left for bedding areas. To me logging has far more benefits than it does drawbacks. Statement: There are no veener logs. If the trees grew close together and have very few, if any branches due to all competing for light and growing straight up you MAY have veneer logs in some of those trees. Can't tell until the tree is cut. Sometimes mineral inclusions will cause a down grade in a log. I'd be looking at the basic theme here and check with the state forestry service, and get at least 3 bids. Also, equipment was mentioned. Some of the newer skidders will be low impact if not used in muddy situations. If anyone has a dozer with a winch set up for logging it will not leave ruts like some skidders. hats off to ya,same here and i even get to manage my neighbors properties and get paid for it. Last edited by pcr2; 02/12/19 10:21 AM. Any such thing as a market for knotty white fir? edt I found the answer, zero per mbf lol. Last edited by Wright Brothers; 02/12/19 11:51 AM. you got that right , around here the are getting paid under the table from big mills not to submit bids and such . people around here finally saw this after a old lady got the screws after a big bid deal , supposed to have been advertised but wasint ,sawmill got some cheap timber and the forester made a bundle. Last edited by logger coffey; 02/12/19 11:02 AM. I've been digging thru the nite looking for qualifying capital gains. Most of the sites I found dont have any dates, a couple was from 1996. I dont know about this one. You forsure have to own it atleast 12 months. For purposes of determining capital gain or loss, timber is considered "cut" at the time when in the ordinary course of business the quantity of timber felled is first definitely determined, rather than at the time of the felling. Treas. Reg. ¤1.631-1. (Sec. 631). If anyone wants to take a stab at interpreting the above about " when cut " for capital gains please do so. I have an idea, but besides being as ignorant as a hog on ice, I still have stuff from over 30 yrs. in my head. After getting a forester, a good tax man might be your next best money maker. I distinctly remember in order to get capital gains the decision had to be made at time of sale and not after you go to your tax guy next year. If you screw up and dont get the capital gains then you will have to pay a higher tax rate plus self employment(social security} because it will be ordinary income. If you bought the land you may be able to put a value on the timber and count that as cost against your gain on the trees, but then that might come off of what you paid for the land which you need records so if you sell the land your cost is less than the amount you took off for the trees. My best advice is a tax man that actually knows what he is doing ? In all honesty to the original poster ,none of use are there and we cant see your timber so it would be hard to tell you the correct thing to do. . you might be getting a good deal or might not . some say they have good timber but sometimes its junk , some have told me they did not have any timber then i looked and it was nice stuff . hope you the best. guy told me he had 20 acres of ash that needed cut-not a local-was some nice poplar when i got there. In all honesty to the original poster ,none of use are there and we cant see your timber so it would be hard to tell you the correct thing to do. . . Very true,however the price he quoted I could get twice that just selling it as firewood in my area.